A map showing Days Landing and the alternative routes for tracks at Te Matuku Bay. Tensions are high over whether public access to Waiheke reserves is more important than keeping kauri trees disease free. Waiheke Local Board decided at its last meeting to defer any decision on developing a new 700-metre track through the Days Landing esplanade reserve at Te Matuku Bay. 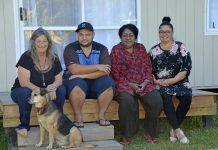 Local board member Shirin Brown, Hauraki Islands Forest and Bird chairperson Jacqueline Joseph and Te Matuku Bay Landcare Group member Hue Ross are all calling for new tracks at Te Matuku Bay to be at least 30 metres from kauri trees. This is in line with recommendations from Auckland Council biosecurity staff, who say “new tracks should avoid kauri, where possible” to protect trees from kauri dieback disease. 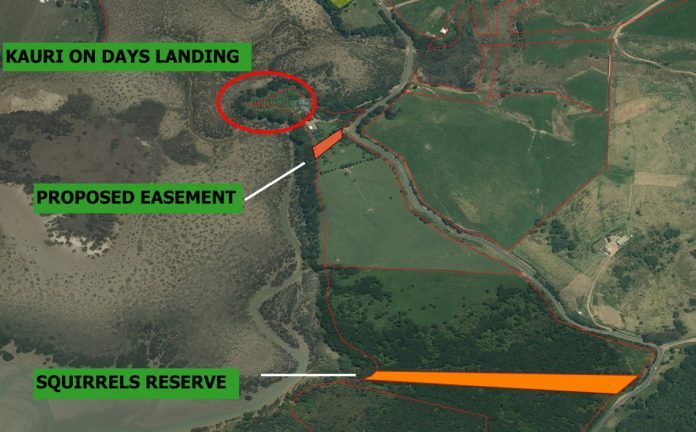 The Days Landing reserve beside 530 Orapiu Road is only about 20 metres wide and contains about six kauri, so Ms Brown and Forest and Bird representatives are calling for the planned Te Matuku Bay track to be created elsewhere. Two options are possible, as the neighbouring landowners, Andrew Grobler and Oktay Ozturk, are willing to provide an alternative accessway and the track could also be built through nearby Squirrels Reserve. However, local board chairperson Paul Walden says the previous owners of 530 Orapiu Road encroached on the reserve, so activities that pose a risk of kauri dieback are already taking place within 30 metres of kauri trees. A fence has historically been built on the reserve, blocking public access, and decks on a house and gardens are also partly on the reserve, he says. Mr Walden does not support barring the public while allowing private encroachment at Days Landing reserve. “This is a special bit of coastline and why would you deny the public the right to enjoy it? “If we’re genuinely looking at all the threats to kauri trees, let’s get them all on the table. “It’s not okay for the public to be excluded when we’re not taking measures to preclude sheep running around, a commercial orchard and raised bed gardens with imported soil within 30 metres of the trees,” he says. Using trigene stations and possibly a boardwalk could ensure that public access to the reserve does not pose an undue risk of kauri dieback disease, says Mr Walden. However, Ms Brown says trigene is “unreliable” and Mr Ross says boardwalks do not prevent kauri dieback, because phytophthora spores in soil can wash off a boardwalk onto tree roots. Mr Ross carries out pest animal management in Te Matuku Bay and says putting a track or boardwalk through Days Landing would create “a really unfortunate vulnerability” to kauri die back disease on the island. “This would be an unnecessary exposure of kauri in the eastern end. “There are lots of big kauri in the area and if we get kauri dieback there it will go crazy – we won’t be able to contain it,” he says. Ms Brown is keen to hear people’s views on the issue. 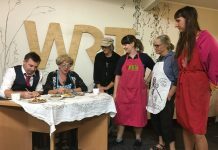 “We really need a steer from the community on whether it’s more important to open the tracks and risk kauri dieback or adopt a cautious approach where people may not see kauri but they know we’re doing our utmost to protect our iconic trees. 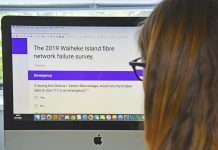 “It’s possible that Waiheke could be the only place that’s kauri die back free and that puts the responsibility on us a bit higher than in other areas,” she says. The decision on the new track route has been delayed until a new local board meets in November or December.